Grounded in Philly is a powerful new web app that makes it easier for Philadelphia residents to turn vacant lots into productive community spacesTwo new initiatives — the Healthy Foods Green Spaces coalition and a new web mapping and organizing tool called Grounded in Philly — will be helping Philadelphia residents come together to turn vacant lots in productive community spaces. On Wednesday, June 26, residents, community gardeners and market farmers of all ages, advocates for green space, techies, and housing and labor activists will gather to mark the launch of these initiatives at an event hosted at the Federation of Neighborhood Centers’ Teens4Good Farm at 8th and Poplar in Philadelphia. The event is from 4-7 p.m., with a press conference at 4:30 p.m. Healthy Foods Green Spaces is bringing together a growing, city-wide coalition of individuals and organizations that support community-managed green space, gardens, and urban agriculture, building collective efficacy through advocacy, grassroots organizing, and community education. This group grew out of the successful grassroots campaign organized earlier this year by the Garden Justice Legal Initiative, Weavers Way Co-op, the Pennsylvania Horticultural Society, Norris Square Neighborhood Project, and many others to stop a zoning amendment that threatened twenty percent of Philadelphia’s existent gardens. 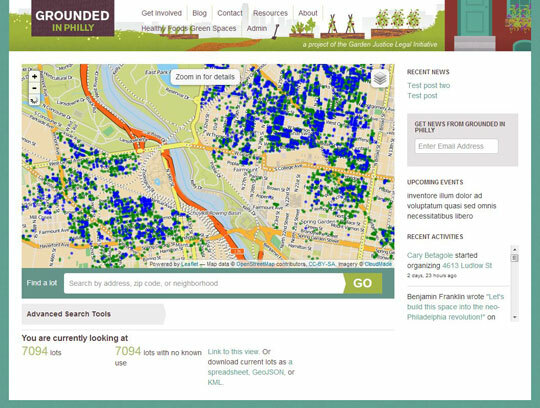 Created through a partnership between the Garden Justice Legal Initiative and 596 Acres in Brooklyn, New York, Grounded in Philly allows users to understand the status of a vacant lot in terms of ownership, zoning, and liabilities, among other characteristics. Grounded in Philly is also designed to connect online users so neighbors can work with neighbors on specific parcels. And, for neighborhoods with already established gardens, Grounded in Philly provides resources on how those spaces might be made more permanent. Philadelphia is home to more than 40,000 vacant parcels, many of them tax delinquent, unproductive, unsafe, and damaging to neighborhoods. Residents have watched for decades as empty homes on their blocks crumble and neighborhoods suffer extended disinvestment. Healthy Foods Green Spaces and Grounded in Philly provide two unique, proactive responses to the city’s catastrophic vacant land problem. Together, Healthy Foods Green Spaces and Grounded in Philly provide platforms for people to organize around creating and preserving essential community institutions and reinvest in neighborhoods. All are welcome to attend the launch party and press conference.